This IFC Original Series created by Oscar nominee Nanette Burstein (The Kid Stays In The Picture, On The Ropes) follows three NYU film students as they try to direct an award-winning film and launch their careers. Former Peace Corps volunteer Alrick prepares a politically charged allegory, sculptor Leah readies her emotionally raw autobiographical project, and Vincenzo applies his experience as an opera director in the making of his urban fable. Over the course of ten weeks, these students assemble crews, deal with difficult locations, clash with the police, face funding crunches, and encounter personal adversity. As the deadline for NYU's First Run Festival approaches, will their films be completed in time? Can their films bring them acclaim and lead to future work? 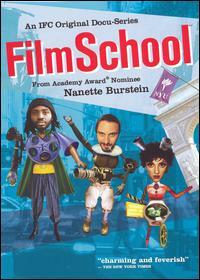 Featuring interviews with acclaimed filmmakers including Martin Scorsese, Spike Lee, and Oliver Stone, FILM SCHOOL is an irreverent, inspirational look at the filmmaking process through the eyes of three aspiring directors. Disc 1: Episodes 1-4 - The student filmmakers assemble casts and crews and ready for shooting amidst personal strife. Disc 2: Episodes 5-7 - Shooting begins, and the student filmmakers must contend with problematic locations, difficult actors, and continuing financial problems.